With all the changes through the process, it was difficult at times to keep up with the provisions of national health reform that applied to home health and hospice. Luckily, the National Association for Home Care & Hospice (NAHC) has released the key provisions for both home health care and hospice, and included the general employer requirements. For more information, see HCA’s other blog posts on what the house passed and the House “reconciliation” summary, or type “health reform” into the blog’s search feature. To have access to affordable long-term services and supports that can sustain individuals in the setting of their choice, including a consumer’s full participation in managing services. To lend meaningful support to caregivers to preserve the beneficial impact caregiving has upon the caregiver, the person depending upon them and society at large. 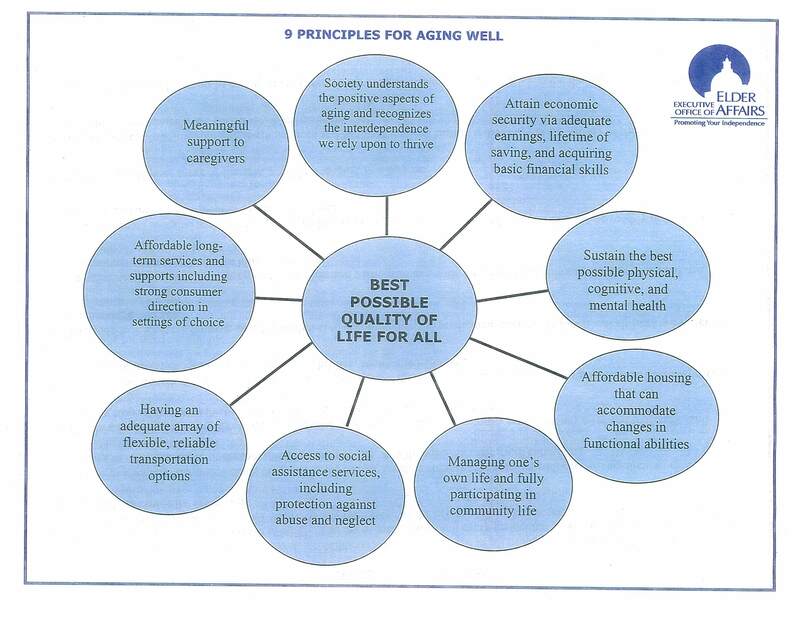 These principles will be used to guide Elder Affairs and the Governor as they move forward with an aging agenda for the future (Click on the above image for a larger view). • Reinstatement of the rural payment differential (add-on) at 3 percent from April 1, 2010 until Jan. 2, 2016. The federal long term care program – the CLASS act – is in, as are demonstration and pilot programs for providing chronic care management, transitions in care, and post-acute care management. All of these should involve home care. With many of the home care cuts delayed, and demonstration projects to help shape, we will need every voice in Washington to make sure our issues continue to be heard above the continuing health care reform roar. With a historic vote set for this weekend where the US House of Representative will vote on the Senate’s health reform proposal, there will again be changes to what may eventually be the final package. In addition, there will be a House supplement or reconciliation bill with provisions from the House proposal. For more information, see the House Committee on Rules Section-by-Section summary of The Health Care & Education Affordability Reconciliation Act of 2010. MassHealth has revised their hospice regulations to reflect changes in CMS hospice rules. The new rules require hospice providers to coordinate their hospice services with the Medicaid personal care benefit, as appropriate. MassHealth members no longer have to waive their PCA services if they elect the hospice benefit. Also, physicians signing the hospice certification statement will be required to personally compose a narrative explaining the clinical findings that support life expectancy of six months or less. MassHealth has also revised the billing guide for the UB-04 which is posted on the MassHealth website. What’s Next for Health Care Reform in Massachusetts? Three days of hearings by the Mass Division of Health Care Finance & Policy (DHCFP) on Health Care Cost Trends in Massachusetts started with a bang as the Attorney General of Massachusetts Martha Coakley released and testified on a report from her office detailing how clout and market share and not quality contribute to wide variation in reimbursement and drive prices up in Massachusetts. Also being considered and discussed by state officials are data on payment variation submitted by insurers – such as these from Harvard Pilgrim Health Care, which also appeared in the Boston Globe. At stake in the discussions are some very immediate proposals by the Governor to expand the authority of the state’s Division of Insurance to approve or deny health insurance premium increases. Longer term, these hearings are about degree of regulatory oversight of premium and rate setting, urgency and viability of global payments and/or systemic payment reform and ultimately, perhaps, the success or failure of the Massachusetts universal health insurance law. Or view the powerpoint presentations as they are posted at DHCFP website. The Home Care Alliance Board of Directors approved an official position for the organization on Accountable Care Organizations, including guiding principles that the home care industry would like to see included as payment reform moves closer to a reality. • Include in the infrastructure design some explicit direction on the use of home health services that supports inclusion of existing quality providers and avoids unintentional development by ACOs of duplicative community care services. Download the ACO position document for more information and contact the Alliance with any questions or comments. You are currently browsing the Think Home Care Blog blog archives for March, 2010.